“And Jesus, full of the Holy Spirit, returned from the Jordan, and was led by the Spirit for forty days in the wilderness, tempted by the devil. And he ate nothing in those days; and when they were ended, he was hungry” (Gospel of Luke, Chapter 4, verses 1-2). What motivated Jesus to spend 40 days and nights of solitude, prayer, and fasting in the Judean wilderness? This desert landscape was largely uninhabitable and was full of dangers for anyone who dared to venture in it for long. Danger from scorching heat by day and extreme cold by night, danger from wild animals and scorpions, plus the scarcity of food and water. 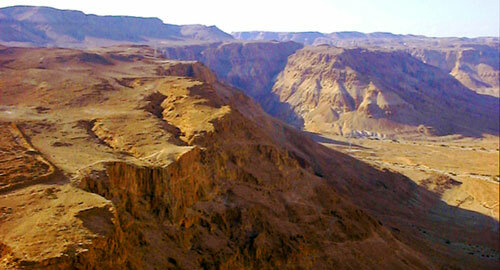 For God’s chosen people Israel and many of their leaders, the desert was a place of testing, encounter, and renewal. When the Israelites were freed from slavery in Egypt, they wandered 40 years in the wilderness. This was seen as a time of purification and preparation for entry into the promised land. Moses went to the mountain of the Lord in the Sinai wilderness and stayed there for 40 days and nights in prayer and fasting (Exodus 24:18). Elijah, after he was fed with bread from heaven, journeyed through the wilderness without any food for 40 days to the mountain of God (1 Kings 19:8). Jesus was without any food in the wilderness for 40 days to prepare himself for the mission that the Father had sent him to accomplish. Why did Jesus choose such a barren, lonely place for an intense and long period of prayer and fasting? Matthew, Mark, and Luke tell us in their gospel accounts that Jesus was led by the Holy Spirit into the wilderness. Mark states it most emphatically: “The Spirit immediately drove him out into the wilderness” (Mark 1:12). What compelled Jesus to seek solitude, away from his family and friends, for such a lengthy period? Was it simply to test himself and prepare for his mission? Or was he also allowing himself to be tempted by Satan? The word tempt in English usually means to entice someone to do what is wrong or forbidden. The scriptural word used here also means to test in the sense of proving and purifying someone to see if they are ready for the task at hand. We test airline pilots to make sure that they are fit to fly under all conditions, including times of adverse turbulence and poor visibility. Likewise God tests his servants to see if they are fit and ready to be used by him. On many occasions God tested Abraham to prove his faith and to strengthen his hope in God’s promises. Abraham obeyed willingly even when God asked him to sacrifice Isaac, the son of promise. When the Israelites were sorely tested in Egypt for more than 400 years, they did not forget God. They kept God's word and remembered his promise to bring them freedom from their enemies. Jesus was no exception to this pattern of testing. He went to the desert without food. Adam and Eve had everything they needed in the Garden of Paradise. But they ate of the forbidden fruit out of disobedience because they trusted in themselves rather than in God. They were cast out of Paradise and driven into the wilderness. Jesus freely enters the wilderness in order to regain Paradise for those who lost it. Jesus refuses food to show his dependence on the bread of heaven, the word of God, that would sustain him not only in his physical hunger, but in his hour of temptation as well. The Lord responded in this way, for it was his purpose to overcome the devil with humility and not with power. ...the Savior’s very response indicates that it was as man that he was tempted: “Not by bread alone shall man live, but by every word that comes forth from the mouth of God.” So if anyone does not feed upon God’s Word, that one will not live. Where did Jesus find the strength to survive the desert's harsh conditions and the tempter's seduction? He fed on God's word and found strength in doing his Father's will. Satan will surely tempt us and he will try his best to get us to choose our will over God's will. If he can’t make us renounce our faith or sin mortally, he will then try to get us to make choices that will lead us, little by little, away from what God wants for us. Jesus was tempted like us and he overcame sin not by his own human effort but by the grace and strength which his Father gave to him. He had to renounce his will for the will of his Father. He succeeded because he wanted to please his Father and he trusted that his Father would give him the strength to overcome the obstacles that stood in the way. Luke says that Jesus was “full of the Holy Spirit” (Luke 4:1). When tempted by the devil Jesus did not try to fight his adversary on his own human strength alone. He relied on the power which the Spirit gave him. Jesus came to overthrow the evil one who held us captive to sin and fear of death (Hebrews 2:14). His obedience to his Father’s will and his willingness to embrace the cross reversed the curse of Adam’s disobedience. His victory over sin and death won for us not only pardon for our sins but adoption as sons and daughters of God. How can we overcome sin and moral weakness in our personal lives? The Lord Jesus gives us his Holy Spirit to help us in our weakness (Romans 8:26) and to be our guide and consoler in temptation and testing (1 Corinthians 10:13). The Lord gives grace to the humble who acknowledge their dependence on him (James 4:6) and he helps us to stand against the attacks of our enemy, Satan, who seeks to destroy us (1 Peter 5:8-10; Ephesians 6:10-18). The Lord Jesus is ever ready to pour out his Spirit upon us so that we can have the strength and courage we need to resist sin and to reject the lies and deceits of Satan. God wants us to “fight the good fight of the faith” (1 Timothy 6:12) with the power and strength which comes from the Holy Spirit. Do you rely on the Lord for your strength and help? Archives • (c) copyright 2008, 2017 The Sword of the Spirit .